After months of research and community engagement across the Sandy-affected region, the BIG Team and the 9 other Rebuild by Design teams have unveiled their final proposals at Brookfield Place in Lower Manhattan and Liberty Science Center in Jersey City on Thursday. The teams, along with hundreds of tri-state residents and government representatives, gathered to view the proposals heard from U.S. Department of Housing and Urban Development (HUD) Secretary Shaun Donovan and Rockefeller Foundation President Dr. Judith Rodin. The Big U is a protective system that encircles Manhattan, responding to the needs and concerns of the island’s diverse communities. 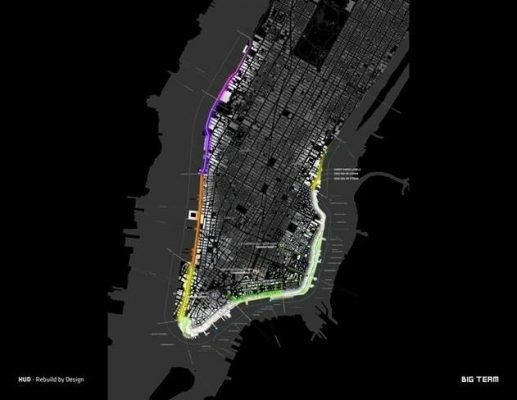 Stretching from West 57th Street south to The Battery and up to East 42nd Street, the Big U protects 10 continuous miles of low-lying geography that comprise an incredibly dense, vibrant, and vulnerable urban area. The team’s approach is rooted in the two concepts of social infrastructure and hedonistic sustainability. The Big U not only shields the city against floods and storm water; it provides social and environmental benefits to the community, and fosters an improved public realm. The team envisions three compartments that function independently to provide flood protection. Each compartment comprises a physically discrete flood-protection zone that can be isolated from flooding in adjacent zones. At the same time, each presents opportunities for integrated social and community planning. The compartments work in unison to protect and enhance the city, yet each compartment’s proposal is designed to stand on its own. Proposed solutions for the components were designed in close consultation with the associated communities and many local, municipal, State and Federal stakeholders; each proposal has a benefit-cost ratio greater than one; and each is flexible, easily phased, and able to integrate with existing projects in progress. Rebuild by Design award winners will be announced later this spring. The HUD Secretary, at his discretion, will consider making allocations from CDBG-DR to state and/or local government to help implement winning proposals. The teams are also exploring the possibility of other federal and non-federal funding sources. The design team finalists involved in Thursday’s events were chosen from nearly 150 international submissions. Each of the 10 teams has worked closely with local and regional stakeholders to develop locally-responsive projects and design approaches to improve the resiliency of waterfront communities. The resulting design innovations include growing breakwaters, the development of absorptive shorelines, off-shore islands, and regional tidal parks. Several proposals incorporate coastal development with both ecological and financial resiliency and retrofitting plans aimed at protecting not only exposed environment but also businesses and communities vulnerable to extreme weather. April 4, 2014 in New York.